# Break the eggs into a deep bowl, add 1 + 1/2 cups granulated sugar all over, blend it until the sugar dissolves in it totally, about 7-8 minutes. # Add yogurt, vegetable oil, sifted flour, vanilla and baking powder into the mixture, mix until get a smooth mixture. # Pour half of the prepared cake mixture into the mould, and flatten its surface. # Place the finely sliced pears onto it firmly. Sprinkle 1 tbsp granulated sugar all over the pear slices at first, then sprinkle chocolate chips. 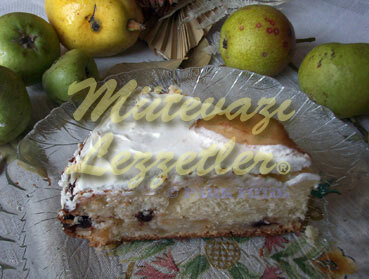 # Pour the remaining cake mixture all over the pear slices and flatten its surface again. Place the pear slices all over, and sprinkle granulated sugar all over. # Place the tray into the oven which is preheated to 347 F. Bake the cake for 50 minutes. # Mix 1 tbsp granulated sugar with 1/3 cup water, and pour this mixture all over the cake after removing it from the oven and cooling down. # Finally cover the cake with the icing sugar which is mixed with milk, refrigerate it for 2 hours at least. Slice and serve. Note: If the pears are so hard, you can boil them for a while to soften.